The project authorities in Andhra have opened the floodgates to let out around 1 lakh cusecs of water to Nagarjunasagar Dam. 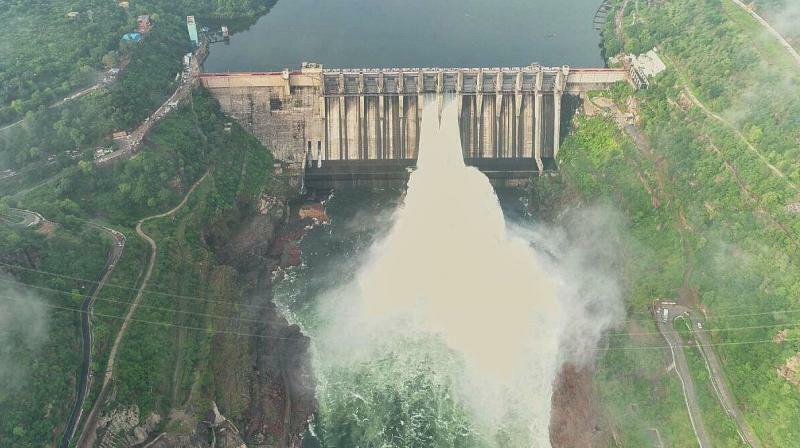 Hyderabad: With Srisailam dam level reaching close to its gross storage capacity, the project authorities in Andhra Pradesh have opened two of the 12 spillway gates on Thursday to let out around one lakh cusecs of water to Nagarjunasagar Dam. Spillway gate number 6 and 7 were opened by 10 feet at 8 in the morning on Thursday. Srisailam reached full capacity level of 885 feet and 215 tmc feet. The spillway gates were opened following the decision of Andhra Pradesh water resource minister Devineni Uma Maheswara Rao. Telangana and Andhra Pradesh have been releasing water downstream through the power generating stations. On Wednesday night, water stood at 884.40 feet at Srisailam, against the full reservoir level of 885 feet. Inflows into the dam continue to be high, at about 1.51 lakh cusecs. The Srisailam dam chief engineer C Narayana Reddy on Wednesday said that the floodgates will be opened between 6 am and 7 am. The Krishna River Management Board too has advised that the water level be limited to 883 feet.